When one is grocery shopping with the family on a Saturday afternoon and the phone rings, and it is a birder, odds are a rarity has been discovered. This happened to me yesterday and, well, the rarity was not only an impressive bird but it was in Queens, at Jamaica Bay Wildlife Refuge. As Daisy and I chose our produce and dry goods I rehearsed in my head different ways the conversation about chasing the bird in question could go. None of the different scenarios ended well at all. When even your imagination can’t come up with a way to make something happen maybe it isn’t the best idea to try. But I’m a birder, and birders are many things, stupid and persistent among them, so as we walked home, pushing Desi in his stroller, I broached the topic. Of course, Daisy, unrecognized saint that she is, readily agreed to let me chase my life Black-bellied Whistling Duck. And, lawyer that she is, she drove a hard bargain. I prefer not to go into the details of our most recent negotiation but I really hope no rarities show up in Queens anytime soon because I don’t know what I have left to exchange. Permission granted, I was changed and my gear was packed in an amazing amount of time, not only because I feared that the second occurrence in New York State of Dendrocygna autumnalis* might decide to move on before I arrived but also because it would be really horrible to have made a deal with Daisy and have it be for naught in terms of my life list. Waiting for the E train to arrive was painful, waiting for the J train was torture, and waiting for the Q53 bus was nightmarish, but I arrived at Jamaica Bay within forty-five minutes or so of setting out, and was pleased to meet birders leaving the West Pond who affirmed the bird’s continuing presence. Arriving at bench six on the West Pond trail I was greeted by a small horde of birders, almost all of them familiar faces, and had the joy of finding the bird on my own, as no one would tell me where it was. Of course, it was right in front of the bench at the edge of the pond, and I drank in my life look, thankful that my deal with Daisy and the mass transit journey was worth it. What a bird! Interestingly, there have been three other Black-bellied Whistling Ducks at Cape May, NJ, for over a week now and two more were reported from Edwin B. Forsythe National Wildlife Refuge, also in New Jersey, earlier in the week. This post has been submitted to Bird Photography Weekly #101. Go check it out! 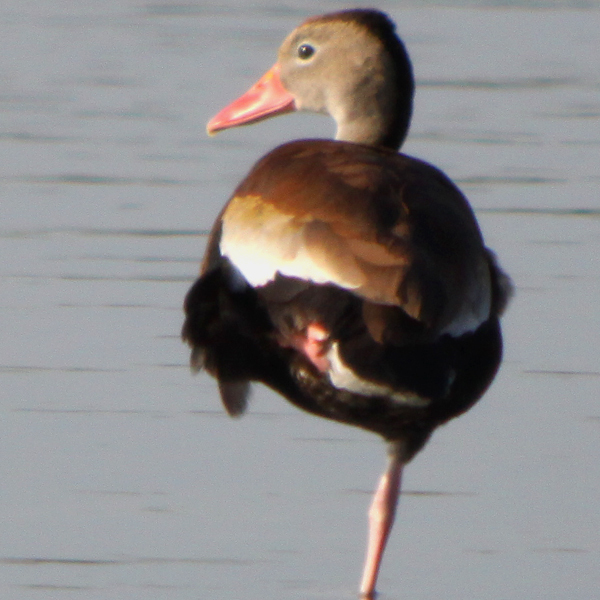 *Assuming, of course, the first record of Black-bellied Whistling Duck, a small flock of five upstate in Brewerton this spring, is accepted by the New York State Avian Records Committee, though, really, there seems to be no reason to think that they wouldn’t accept the record. Being married and a father myself, I am far more curious about the bargain then the story of how you saw the bird. Judging by my personal experiences, you must have sold your soul and given in to eternal slavery in order to be granted permission to see the bird. Too bad, really, as the Black-bellied Whistling Duck is a mighty fine bird, but pales in comparison to the Slender-billed Curlew I sent your way for next weekend’s entertainment at Jamaica Bay. @Jochen: Sorry, nondisclosure was part of our deal. And if there were a Slender-billed Curlew, well, I don’t even want to think of the deal Daisy could get then! And your new approach works well…I’m sending you a YCNH. That bird is a beaut. I’m glad you fared better at finding a whistling duck at Jamaica Bay than I did when I tried it years ago! 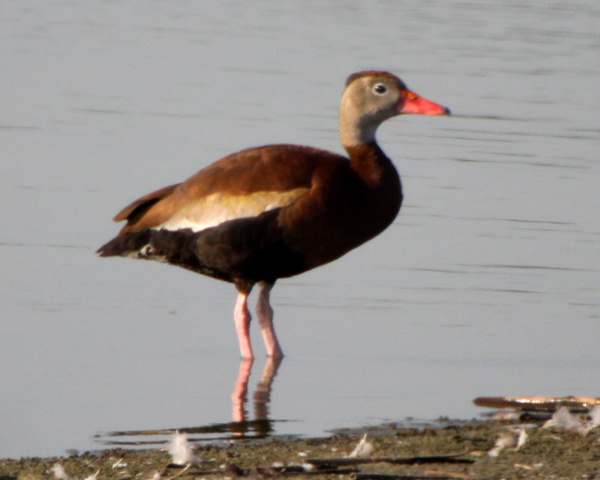 I remember my first and only Black-bellied Whistling Duck…it was Thanksgiving Day 2006. I was living in Mesa, AZ at the time and my birder father-in-law was in town. I saw that morning on the AZ listserv a report of both a Fulvous and a BB Whistler, and Ross’s Goose to boot, in a pond at Chaparral Park in Scottsdale. He and I both sold our souls to our wives, and I promised to take the kids for the ride to see the ducks while the turkey cooked! Awesome looking ducks! A strategic bargain, especially considering the duck was gone today! And, 45-minutes on public transportation in NYC on a Saturday? That is good luck indeed. Your predicament of how to bring up the bird chase to Daisy brought up all the empathy I could muster Corey. However, tough times require toughness on the part of all parties involved and all I can say is, I’m glad my wife is not an attorney! I’m glad you got to see that beautiful duck. Maybe I will spot a Black-bellied Whistling Duck one day. We don’t get ducks like this around here. Just your usual mallards and generic “ducks”. He’s a very pretty specimen. An exciting find and wonderful photography. I’ve never seen anything like this before. Beautiful captures and an excellent find Corey! One of these were spotted at the Sanford Sewer District ponds in Sanford, Maine about a week ago. @Vinny: It was nice to meet you. @Idaho Birder: That sounds like a trio of birds worth selling your souls for! 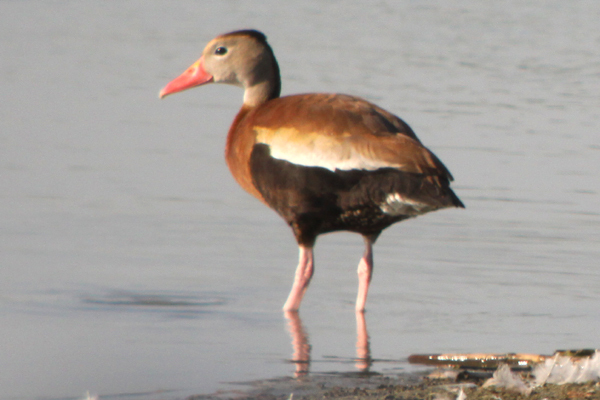 @Larry Jordan: May your wife remain not an attorney and may a Black-belied Whistling Duck show up in California so you can get better pictures than I did. @Gwen: It’s smiling because it is really a Mallard in a whistling duck costume and it is enjoying all of the attention. @MaineBirder: Wonder if it is the same bird, and, if so, where it has been for a week? I had a rare experience this past June 29, 2010. A combined Black Bellied Whistling duck and wood duck nest hatched and jumped from my 8 foot raised nest box. 17 eggs were laid, 15 BBWD and 2 wood duck. 11 BB’s and 1 WD actually jumped , one egg , 3 BB ducklings and 1 WD duckling were left behind, too wet still to leave the nest. My nest box entrance is the recommended 3 X 4 inch oval, but the BBWD’s have no trouble with it and you know both male and female which look identical incubate the eggs. These Black Bottom ducks are not really new, we’ve been seeing them in flocks down here in Houston,Texas. Also they are not really ducks. They actually are members of the swan family. They have a very distinct whistle when they fly over. We tend to call them Black Bottom Whistlers. We had a male and female nest in our pond, and had one baby, It was very neat to watch them. @Betty: No one said that they are “new” whatever that would mean, just that they are a real rarity in New York. Also, they are not members of the “swan family” but are in the genus Dendrocygna. What Would You Buy For The Birder You Love?